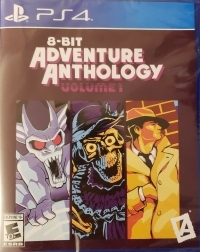 8-Bit Adventure Anthology on physical disc for the PlayStation 4. Standard edition is limited to 3,000 copies available worldwide. Region free. Limited Run #182. This release includes re-releases of three classic NES point and click adventure games: Shadowgate, Déjà Vu, and Uninvited. 8-BIT ADVENTURE ANTHOLOGY: VOLUME 1 is a compilation featuring faithful remakes of three of the best 8-bit point & click adventure games ever made. Originally released between 1987-1991, each stand-alone adventure features the same mind-blowing puzzles, graphics, and music that mesmerized generations of console gamers! 02-22-2019 Flashback2012 Description • Additional Packaging Item Number(s): LR-P113 (Spine), MRLR-0182-CVR (Back Cover) • Disc Item Number: CUSA-10150 8-Bit Adventure Anthology on physical disc for the PlayStation 4. Standard edition is limited to 3,000 copies available worldwide. Region free. Limited Run #182. This release includes re-releases of three classic NES point and click adventure games: Shadowgate, Déjà Vu, and Uninvited. 02-22-2019 Flashback2012 Box Text 8-BIT ADVENTURE ANTHOLOGY VOLUME 1 8-BIT ADVENTURE ANTHOLOGY: VOLUME 1 is a compilation featuring faithful remakes of three of the best 8-bit point & click adventure games ever made. Originally released between 1987-1991, each stand-alone adventure features the same mind-blowing puzzles, graphics, and music that mesmerized generations of console gamers! This is a list of VGCollect users who have 8-Bit Adventure Anthology Volume 1 in their Collection. This is a list of VGCollect users who have 8-Bit Adventure Anthology Volume 1 in their Sell List. This is a list of VGCollect users who have 8-Bit Adventure Anthology Volume 1 in their Wish List.